During the MCIT Board of Directors meeting July 13, board members voted on aggregate rates for 2019. The board approved no adjustment in property/casualty aggregate rates for 2019 and a reduction of 6.4 percent for aggregate workers’ compensation rates. The rate decisions were based on analysis from Actuarial Advisors, MCIT’s long-time actuary. According to Mark Doepke of Actuarial Advisors, decreases in the cost of auto and general liability claims were offset by the increased cost of property, auto physical damage, public employee liability and law enforcement liability claims. As such, he suggested that property/casualty rates remain unchanged for 2019. The rates for 2019 also anticipate a slight increase in the cost of casualty reinsurance costs. The impact of lost costs associated with defending Data Privacy Protection Act (DPPA) violation claims dipped significantly, as the cases were resolved and reinsurance recoveries were received, which aided in no rate increase for 2019. Doepke noted that during the past 10 years, property/casualty base rates have decreased nearly 33 percent. Although the aggregate rate remains the same for property/casualty coverage for 2019, other factors may contribute to an increase in an individual member’s 2019 property/casualty contributions, such as changes in its exposure base during the past year (e.g., addition of staff, increase in the annual budget) and increases to the value of buildings, contents and property in the open. To ensure that members’ property is adequately protected in the event of a loss, property valuations, in conjunction with the Marshall-Swift appraisal indicators, require an increase in building values of 3.8 percent. Using statistical data from the U.S. Department of Labor, values for contents and property in the open will increase by 1 percent. 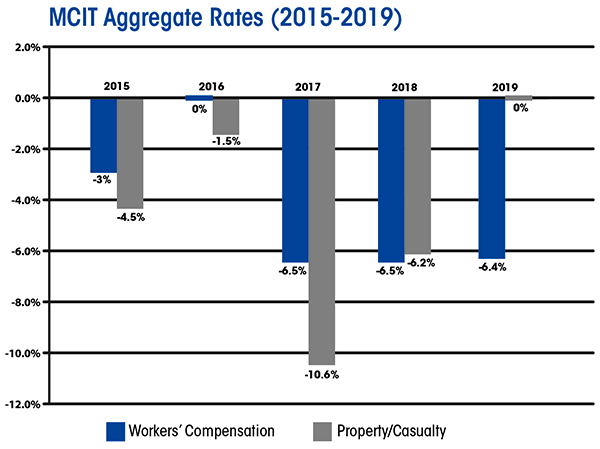 Special Compensation Fund and Workers’ Compensation Reinsurance Association rate reductions along with a decrease in claim expenses contributed to the decision to reduce aggregate rates for workers’ compensation by 6.4 percent in 2019. The reduction also anticipates no change in MCIT’s reinsurance retention level. Members’ individual 2019 workers’ compensation contributions are determined in large part by changes in total payroll; the distribution of that payroll among class codes; and claims incurred during 2016, 2017 and 2018, which are the loss years used to derive the 2019 experience modification factors. 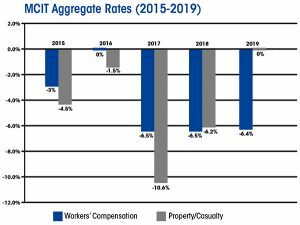 The 2019 rate reduction represents a continuing downward trend in workers’ compensation rates since MCIT began self-administration in 2005. The rate reduction is expected to save members approximately $770,000. To complete the report on renewal rates for 2019, MCIT Underwriting Manager Gary Severson advised that equipment breakdown coverage rates from Hartford Steam Boiler will remain the same as 2018. The bond coverage (first $50,000) provided by MCIT will remain the same as well, and excess coverage (over $50,000) provided by Old Republic also remains unchanged. The cost of canine coverage sees no change for 2019. Members will receive individual renewal notices by mid-August. Invoices will be mailed along with the 2019 MCIT Coverage Document in December.